[..] Citing a leaked central bank document, Reuters reported Tuesday that prices of basic items like meat, cooking oil and clothes had risen 223 percent in the past week alone. [..] The central bank’s latest response to these problems, announced this week, was to declare inflation illegal. From March 1 to June 30, anyone who raises prices or wages will be arrested and punished. Only a “firm social contract” to end corruption and restructure the economy will bring an end to the crisis, said the reserve bank governor, Gideon Gono. [..] The black market, which already flourishes beyond the reach of tax collectors and regulators, is likely to grab an even larger share of the economy when the government freezes prices in March, because stores will be unable to make a profit selling products at government-fixed prices. What the hell is a "black market"? Informal economy perhaps? 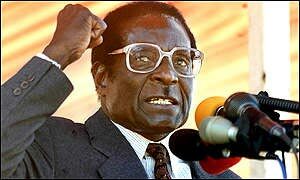 February 12, 2007 9:22 a.m.
You gotta love that Robert Mugabe. The hero of the left when he was throwing over Rhodesia and ushering in a model socialist state. Which is what we all can look forward too if and when the activists get their loving tentacles into the machinery of power. It is amazing how consistent these Bolshevik rulers are when they are in power. February 12, 2007 4:57 p.m.
February 14, 2007 11:06 p.m.